As I mentioned yesterday, we have been playing musical rooms at our house since we decided to turn the TV room into my home office. That necessitated moving the TV into the living room which meant that we had to change around the living room a bit to accomodate TV watching etc. And here is the lighter, brighter after version. We had wanted to bring in a sectional, but after much deliberation, we liked the idea of adding a second sofa instead. So we purchased another sofa identical to the one we already had (an Ektorp from IKEA) and bought fresh new linen slipcovers for both. Then I decided to switch out the dark rug for a fresh and pretty blue version...which, of course, necessitated switching out the dark pillows for some new spring-y colored ones. The entry hall with its hand-painted wall remained the same...I loved the wall and couldn't change it. Here is a view of the living room looking the other way toward the dining area and kitchen. I love how the 2nd sofa really helps to define the space. I just love this view of the living room. And here is the other side of the living room. We placed the TV against the gallery wall. You may recall that I really wanted a mirrored console to put the TV on...so we MADE one. Well, we purchased an old dresser off of our local online classifieds, then painted it and added the mirror ourselves!! I'll give you the full run-down on how we did it tomorrow. I absolutely LOVE the way it turned out! 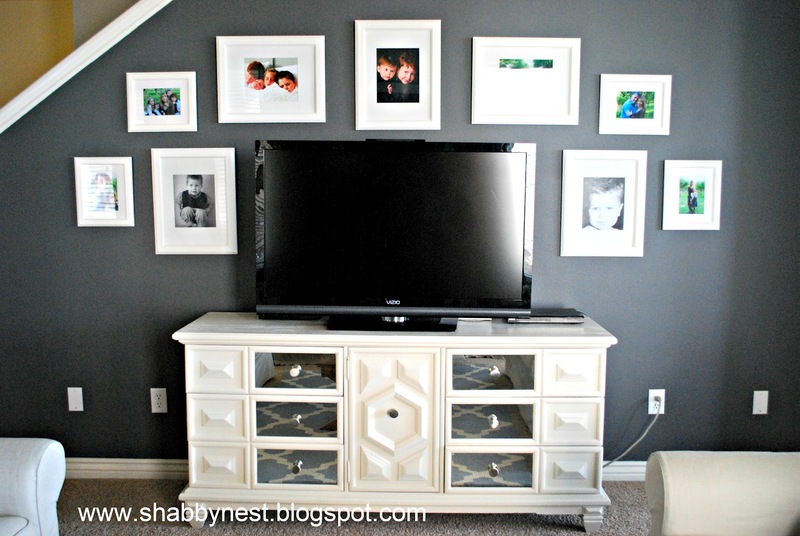 Then we just moved the photos on our gallery wall to frame out the TV. It's a great way to incorporate a TV into the design of a room. Here's another picture of the opposite side of the room. ( The ugly black eyesore over the window is actually for the surround sound that will be going up at some point...oh the joy.) I brought my moss monogram in from the front door because it is so windy here, and the letter is so light that it was getting ruined on the door...it found a nice home on top of the bookcase. 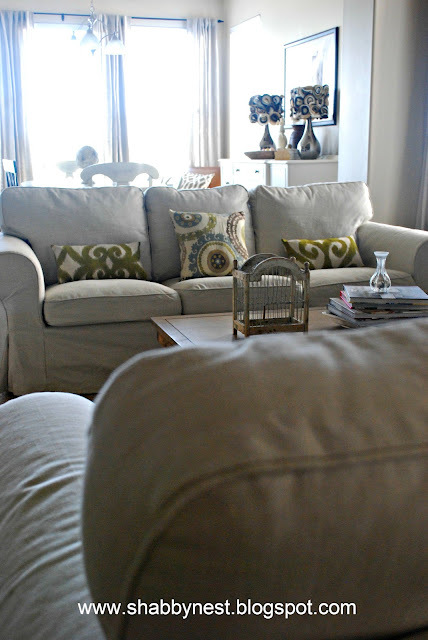 A close up of the sofa and throw pillows. Love the colors. And one final view of the over all room. Such a happy change. 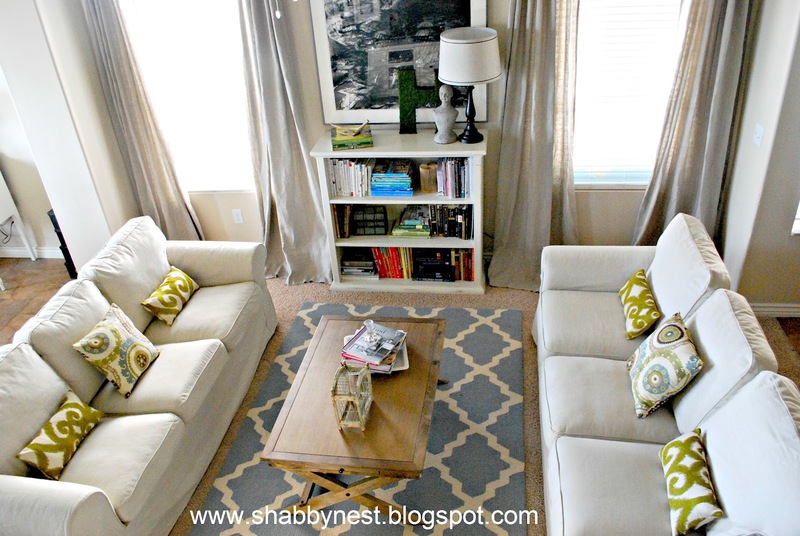 i really love that new rug and i love the bright touches of green! so fun! Loving the green and blue! Looks great! I switched my sofa to face two chairs instead of the tv and it made everything so much better. I love your set up. Lovely re-do. Love the matching sofas and the mirrored console for the TV. your room turned out lovely. Love your color choices in your pillows and rug. 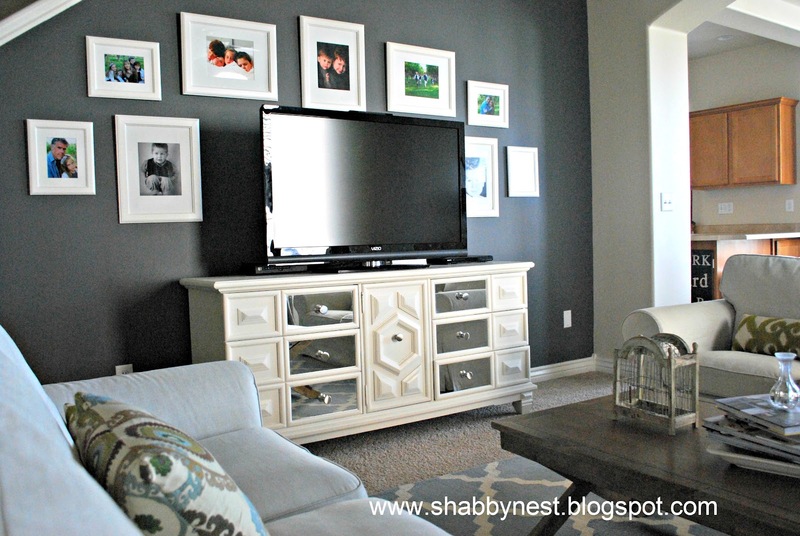 I especially like how you positioned your gallery wall on the same wall as the tv, now when your hubby or someone else is watching something you are not interested in you can look at your kids! I love that rug! 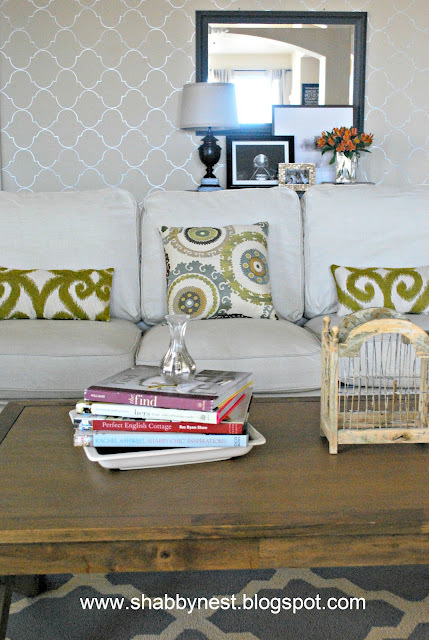 And your coffee table from World Market is so chic! It looks wonderful!!! What a happy change - the pillows are awesome! It's so much brighter and light! I love it! Very nice! Your room looks bright and fresh. I so need a new rug!!!!!!!! 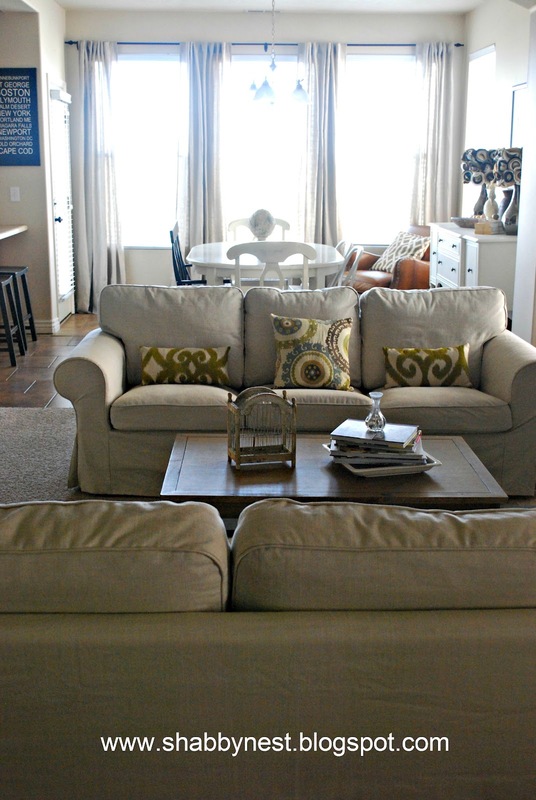 Your living room looks great, and so fresh with the changes. I love the look of the second sofa, and what a fantastic makeover on the tv dresser. Wow, it looks great! I especially like how you incorporated the TV into the gallery wall. It's definitely something I'm going to keep in mind! I love the redo, flat screen tv's are great to blend in with the pictures...your pillows and rug choice are really light and fresh. your livingroom looks amazing!! !I love the two couches and my favorite is your gallery wall around the tv. Love it. It looks so fresh and inviting. 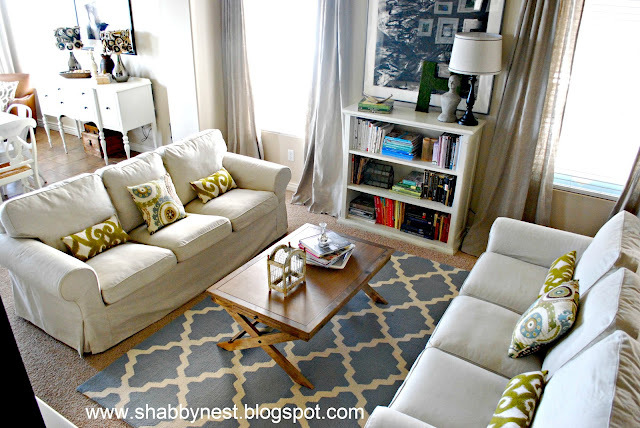 I have the same rug in Navy and a yard of the same green pillow fabric which I also plan to use for pillows. I love the suzani fabric as well and might have to add that to my plan too! What a gorgeous redo! Fresh, cheerful and lovely. It looks great. I love the lighter look. Love the transformation! The living room looks sunny and brighter! It's fabulous, Wendy! I'm so glad you referenced where you got stuff-- on the lookout for a new rug! Brilliant! I don't know what my favorite element is. The media piece is killer. What a transformation that must have been. Love the stenciled wall. Glad you kept the blue wall. Really, this is WOW. Beautiful updates, Wendy! Wow! I love the color you've incorporated and the new media console is gorgeous! Great job! What a gorgeous room! I love the layout. As always PERFECTION! i love the symmetry of the identical sofas and the pillows! look AMAZING! Looks great! 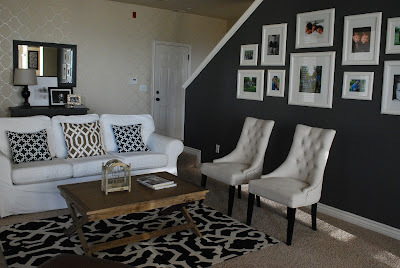 Love the mirrored sofa placement and the lighter, brighter look. Super job on the console too, the mirrored elements are super glam! I was just wondering where you got your lovely slip covers? Thanks. Love your new living room! Wonderful transformation! I love the simplicity. Beautifully done! So pretty and bright! I've never purchased furniture at IKEA before-did you get the slipcovers there? I'm hunting for a couch for our playroom and don't want to spend $$ on one since it's for the kiddos! I may have missed it in an earlier post but where did you get your window panels? Hey! I have those same pillows (the blue/green/brown ones that look like gears.) I bought mine at Garden Ridge, though. 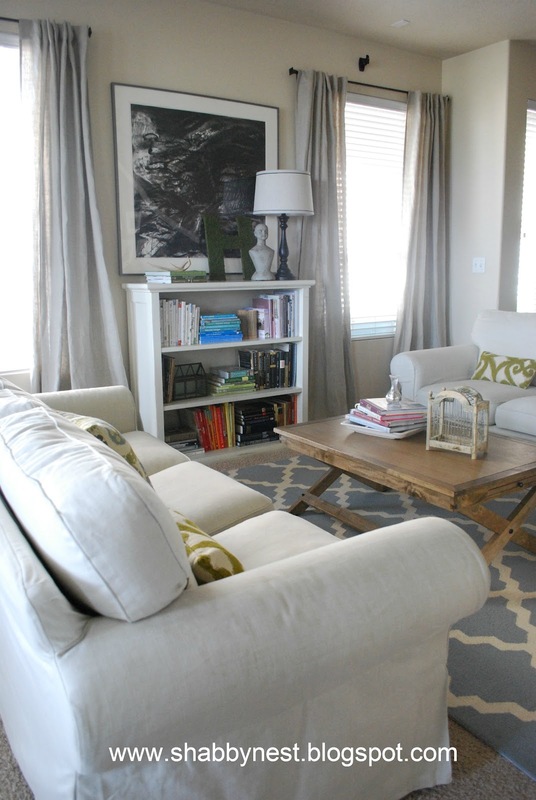 Love your whole look and I am coveting that rug! I Love this room, inspires me! HOW do I make these MOOD BOARDS? Please help I need to show my husband I bring things all together, he's not visual. GORGEOUS update! We have the Ektorp sectional from Ikea and adore it. 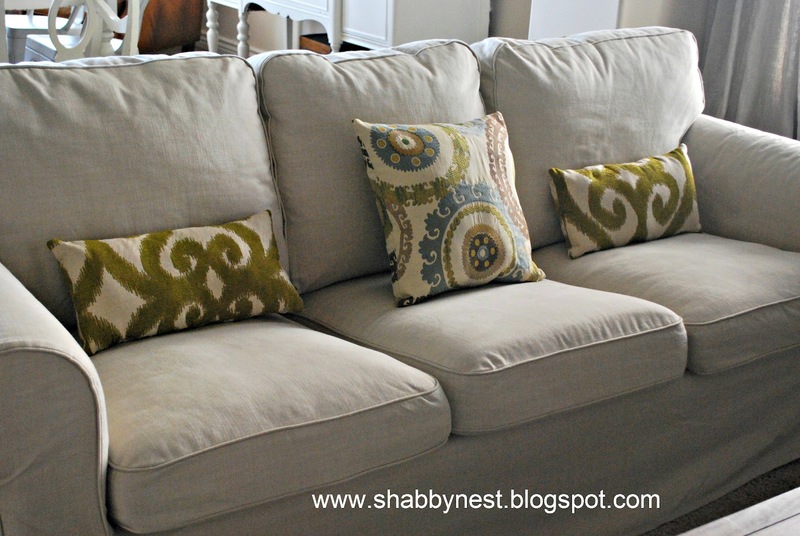 I'd love to know what slipcover you purchased! Oh yeah the new living room is great. Love those Ikea sofas. We don't have an IKea unless we go to Denver and I'm not driving to Denver.those people drive like maniacs from Denver over continental divide west. NO thanks. LOve your new arrangement in l/r, big improvement, more cozy. Your new console is awesome too. What a find and wasn't it alot more fun to make up your own and save all that dough? What a fantastic use of your space, even though you added a whole sofa, I think it looks bigger than your arrangement before. What a cozy, beautiful, inviting space! Wendy, your living room looks so lovely! The light colors and that dark TV walls all work so well together, and I just adore two sofas facing each other for an intimate conversation area. Love it. Beautiful...so fresh and calming. 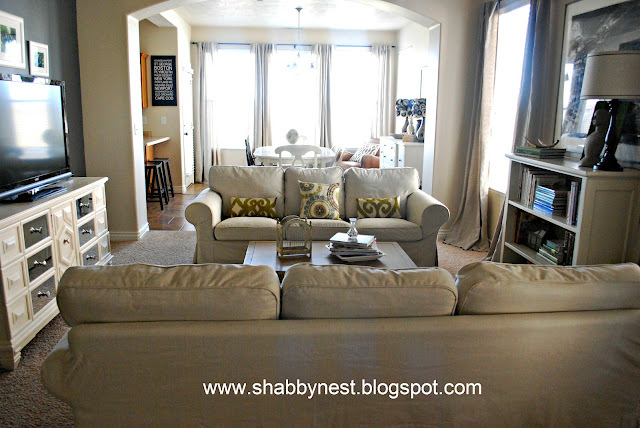 Are your sofa slipcovers Svanby beige from Ikea? Hi, I enjoy the renovations. I was wondering if the rug is this one: http://www.rugsusa.com/rugsusa/rugs/rugs-usa-moroccan-trellis/navy-blue/200HJHK03F-76096.html in the Light Blue. In your pictures, it looks very blue; however, on their website it looks more greenish blue. I was wondering what was the true color? Thanks! I love the transformation! I'm looking for some ideas and inspiration for my own living room. I live in an apartment so space is tight, but I want it cozy. I love neutral colors with a splash of bright colors. Thank you for sharing!